1. Preheat the oven to 220°C, gas mark 7. Combine the sugar, allspice and orange zest in a small bowl with seasoning. Pat the beef dry on kitchen paper and rub on all sides with the sugar and spice mix. Place in a roasting tin and roast for 30 minutes. 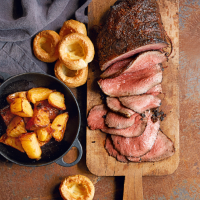 Reduce the oven temperature to 180°C, gas mark 4 and continue to roast, allowing 35-40 minutes for medium rare (or 55°C on a meat thermometer) or 1 hour (65-70°C) if you prefer it cooked through. 2. As soon as the beef is in the oven, cook the potatoes in boiling, salted water for 8-10 minutes until softened. Tip into a colander and shake well to drain and fluff up the potatoes. 3. Heat 4 tbsp of the beef dripping or oil in another roasting tin on the shelf over the meat for several minutes until very hot. Carefully tip in the potatoes and turn in the oil to coat. Roast above the meat, turning the potatoes occasionally. 4. For the Yorkshire puddings, put the flour and salt in a bowl and make a well in the centre. Add the eggs and a little of the milk mixture. Whisk the liquid, gradually incorporating the flour until smooth. Pour in the remaining milk and whisk until smooth. Transfer to a large jug for easy pouring and set aside until the beef is cooked. Dot the remaining dripping into a 12-hole Yorkshire pudding tin ready for cooking. 5. Transfer the cooked beef to a carving platter or board, cover with foil and leave to rest in a warm place. Increase the oven temperature to 220°C, gas mark 7 and transfer the potatoes to the lower shelf. Put the Yorkshire pudding tin on the top shelf for 10 minutes to get the fat really hot. Pour in the batter (it should sizzle) and bake for 25 minutes or until risen and deep golden. 6. For the gravy, drain off the fat from the roasting tin, leaving the roasting juices. Add the flour and stir over the hob for 1 minute. Add the red wine and bring to the boil, scraping up the sticky bits from the base of the tin. Add the stock and cook for 5 minutes until slightly reduced and thickened. Strain into a gravy jug and serve with the carved meat, potatoes, Yorkshire puddings and a seasonal green vegetable.